Couldn't find the personnel for this one so I thought I would present what was found regarding where it appears to have been sent after pressing. USS Little Rock (CL-92/CLG-4/CG-4) was one of 27 United States Navy Cleveland-class light cruisers completed during or shortly after World War II, and one of six to be converted to guided missile cruisers. She was the first US Navy ship to be named for Little Rock, Arkansas. Commissioned in mid-1945, she was completed too late to see combat duty during World War II. After an initial South American cruise, she spent the next few years serving off the east coast of the U.S., in the Caribbean, and in the Mediterranean. Like all but one of her sister ships, she was retired in the post-war defense cutbacks, becoming part of the Atlantic Reserve Fleet in 1949. 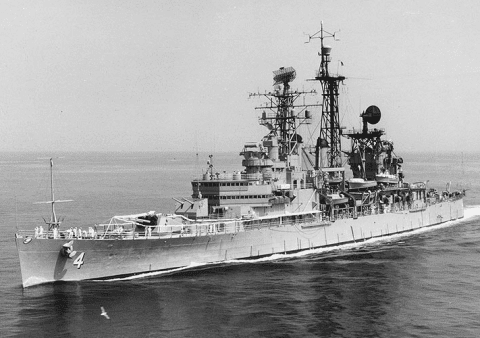 In the late 1950s she was converted to a Galveston-class guided missile cruiser, which involved removing all her aft guns and rebuilding her aft superstructure to accommodate the Talos missile system. Like most of the Cleveland ships converted to missile ships, she was also extensively modified forward to become a flagship. This involved removal of most of her forward armament to allow for a greatly enlarged superstructure. She was recommissioned in 1960 as CLG-4 (and in 1975 redesignated CG-4). In her new career she served extensively in the Mediterranean, often as the Sixth Fleet flagship. She decommissioned for the last time in 1976, and is now a museum ship in Buffalo, New York. Little Rock is the sole surviving member of the Cleveland class.